Ferrari has pulled off a few conjuring tricks this year to assist Michael Schumacher to win some spectacular victories, but if team boss Jean Todt had entertained any dreams on Saturday night that on race day he would end up on the podium, embracing Michael, he was to be disappointed. This was not to be their finest hour. But despite that Ferrari still won the race, thanks to a fine drive by Rubens Barrichello, who was solid as a rock under extreme pressure from Kimi Raikkonen and Jenson Button and thus guaranteed that he will finish second in the Drivers' Championship in 2004. About the only thing that Michael could say at the end of a very difficult day is that he went home with the fastest lap of the race. The race underlined the feeling from qualifying that Michael was not his usual serene self. He made a mistake in qualifying and he made another in the race. Something was bothering him. There were whispers of a bust-up with some of the team on Thursday but no-one seemed willing to explain. "This was a slightly more interesting race than I would have wanted," Michael said afterwards. Michael started from pitlane, worked his way up to 10th place and then ran into the Jaguar of Christian Klien. This left the Austrian hobbling into pitlane and retirement. This did not cost him much time but a few laps later Michael went spinning off of his own accord and threw away 10 hard-earned seconds. He also lost three places. Had the spin not happened Michael would have come out after his pit stop on lap 20 three or four places further up the order than was the case and he would not have been stuck behind Jacques Villeneuve. Those 10 seconds were absolutely vital because Villeneuve was on the same strategy as Michael. If he had been ahead of Villeneuve and Webber the road ahead would have cleared as the two-stop racers ahead of him went into the pits and Michael would have been up to third or fourth when he had a puncture on lap 35. He could have overcome the problem and still made it home with a few points. But as it turned out the puncture simply accentuated the problems and Michael ended up 12th. The points did not matter of course but there have been very few occasions during his career when Michael has finished races outside the points. 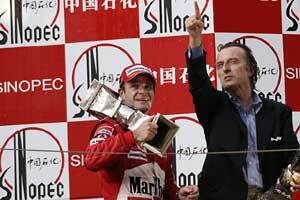 And so it was that Barrichello was left firmly in the spotlight and he did a very good job. He made a good job and then held back a rampaging Kimi Raikkonen until the first pit stops. The two men stopped on the same lap but neither really gained or lost and then Rubens held Kimi back for 18 laps. At the second stops McLaren decided to run Kimi light in an effort to get him ahead of the Ferrari but the strategy misfired in the worst possible way as he came out behind Button. What McLaren had not realized was that Jenson was going for a two-stop race and Kimi was stuck behind him. When Raikkonen came in nine laps later he had lost all hope of challenging Rubens and was behind Button. He closed right up in the closing laps but Jenson had him covered. "It didn't work out," admitted team boss Ron Dennis. "In effect we handed second place to Jenson." And with it went two points which in two races from now might be the different between fourth and fifth in the Constructors' World Championship. David Coulthard would have scored too but a collision with Ralf Schumacher led to an extra pit stop and ninth place. McLaren had worked miracles this year with the MP4-19B but the team cannot afford to throw away points in this fashion. Having said that Williams also wasted opportunities because Ralf's collision robbed the team what would have been a couple of points and would have pulled the team away from McLaren. Montoya did a solid job and finished fifth while Ralf was further ahead until the collision with Coulthard. The accident came at the wrong moment and the decision had to be taken to shove the car out of the way to avoid ruining Montoya's race as well. Ralf's car was then examined and sorted out and the engineers were keen to get Ralf on his way again. Yes, he was two laps down by then, but you can still score points and one can never tell how many other cars will retire. Refusing to go out again was not a move that will get the team excited about Ralf for the last two races. Indeed it might make Antonio Pizzonia look ever more attractive. Button did another splendid job for BAR. He drove hard and fast and did not make any mistakes. He was close to the pace but not quick enough to have won, but eight points is a good haul and with Takuma Sato doing another solid job to drive from the back of the grid through to sixth, the BAR team moved further ahead of Renault in the Constructors' Championship, increasing the gap from three points to a much more solid nine points. Fernando Alonso did what he could to end the day in fourth place while the team's new signing Jacques Villeneuve finished 11th. "We weren't quick enough," said team boss Flavio Briatore with admirable honesty and a sound grasp of reality. The big question after the race, nine floors up in the media centre, was whether or not Jacques had done a good job. Opinions differed. Jacques was thrown in with little time to prepare and admitted that he had learned a lot but with only three races available learning is a luxury. Renault needs points or a monster dose of luck. Let us see what Jacques does in Japan and Brazil. One man who will be watching with much interest is Jacques's new team boss Peter Sauber who has committed himself to running the Canadian next year. The Saubers looked good in China but seventh and eighth places were a bit of a disappointment, given that Felipe Massa had qualified fourth and Fisichella seventh. The problem was graining of the tyres which cost the two drivers around two seconds a lap. Mark Webber ended the day 10th and two laps down but he had driven a pretty solid race, hanging on to places rather than being in a position to fight. With Klien out of the way thanks to Michael Schumacher, Jaguar's hopes of a point or two to encourage potential buyers were dashed. Jordan got both cars home with Nick Heidfeld 13th and Timo Glock 15th. The word in the Jordan camp was graining. Toyota's day was one of complete frustration. Olivier Panis's qualifying speed was worthless at the start as the Frenchman was left sitting on the grid when the anti-stall system kicked in for no reason other than a gremlin was running around the electric circuits This was a complete disaster because Panis was on a three-stop strategy and needed to make places early in the race. He ended up 14th. Ricardo Zonta did a good job at the start and catapulted himself from 13th on the grid to ninth at the end of the first lap, The three-stop strategy worked much better for him as a result and he might have got a point but his race ended on lap 36 with a gearbox failure. And down at the back we had Zsolt Baumgartner, three laps behind but plugging along by himself as usual. He had overshadowed Gianmaria Bruni as usual. The major incident in his race was when he skidded in the pitlane and managed to hit one of his own mechanics although fortunately the only damage was a few bruises. Bruni's race was ruined early on when a puncture led to a slow IN lap. He could not do much after that and he could do nothing at all when one of front wheels fell off. It had been a most entertaining race with a tense and exciting battle which made for good television. The grandstands were full. Things were good. A little more flexibility and a little less ego amongst those running the sport and things would be nearly perfect. Amazing, isn't it? There's not that much wrong with F1.